As adults, we’re fairly accustomed to contracts for car loans, new employment, or updates to our smartphones. But contracts can also be beneficial in the classroom setting. A contingency contract is defined as “a mutually agreed upon document between parties (e.g., parent and child) that specifies a contingent relationship between the completion of specified behavior(s) and access to specified reinforcer(s)” (Cooper, Heron, & Heward, 2007). There are several studies that indicate using a contingency classroom can be beneficial in the classroom setting. (1) Interview the parent or guardian of the student. This allows you to work together to identify problem behaviors to be addressed, identify the contingencies currently maintaining these behaviors, determine the child’s current reinforcers, and establish what reinforcement or punishment procedures will be used. (2) Use this information to create a clear, complete, and simple contract. The authors provide examples of how these contracts might look. You can vary the contract based upon the behaviors you are addressing with your student and the student’s ability to comprehend such contracts. (3) Build data collection into the contract itself. You can see an example from the article below. For this example, it is clear how points are earned and how the child can utilize those points, and the contract itself is a record of both the points and the child’s behaviors. Cantrell, R. P., Cantrell, M. L., Huddleston, C. M., & Wooldridge, R. L. (1969). Contingency contracting with school problems. Journal of Applied Behavior Analysis, 2(3), 215-220. Bailey, J. S., Wolf, M. M., & Phillips, E. L. (1970). 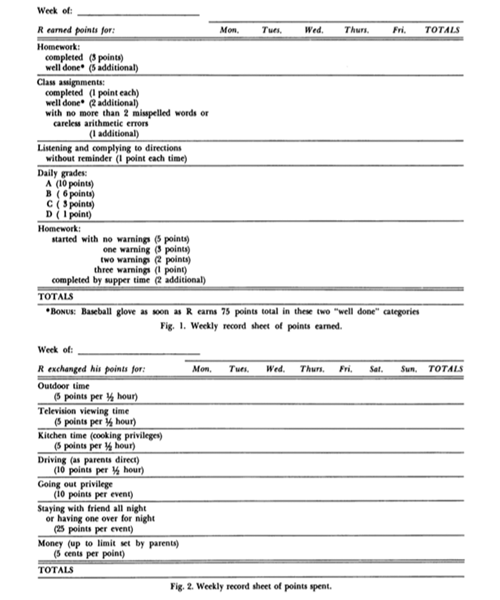 Home-based reinforcement and the modification of pre-delinquent’s classroom behavior. Journal of Applied Behavior Analysis, 3(3), 223-233. Barth, R. (1979). Home-based reinforcement of school behavior: A review and analysis. Review of Educational Research, 49(3), 436-458. Broughton, S. F., Barton, E. S., & Owen, P. R. (1981). Home based contingency systems for school problems. School Psychology Review, 10(1), 26-36. Miller, D. L., & Kelley, M. L. (1991). Interventions for improving homework performance: A critical review. School Psychology Quarterly, 6(3), 174. Teaching language skills is one of the most frequent needs for children with autism, but also one of the most misunderstood skillsets amongst both parents and practitioners. The desire to hear your learner speak in full sentences can be overwhelming, making it especially difficult to take a step back and consider what it means to communicate and how communication skills develop in neurotypical children. Many times we get hung up on what a child should be capable of communicating at a certain age, rather than focusing on what they are capable of communicating at this stage of development. 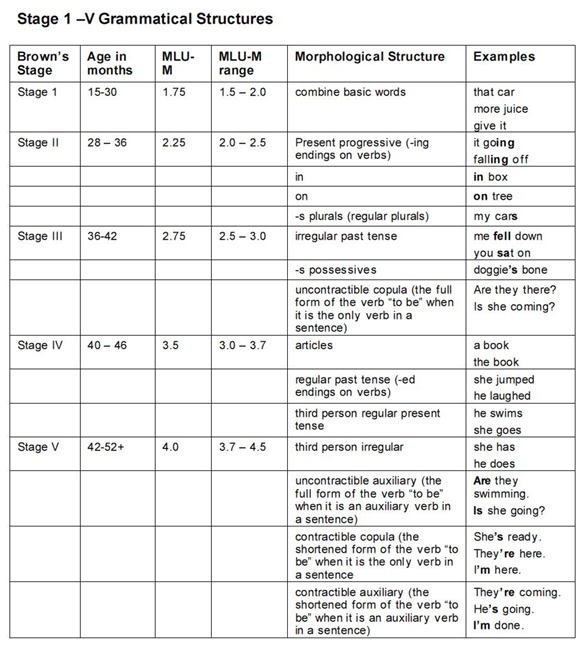 Many practitioners and curricula utilize Brown’s Stages of Language Development. * Brown described the first five stages of language development in terms of the child’s “mean length of utterance” (or MLU) as well as the structure of their utterances. Sometimes it is necessary to compare a child to his or her same-age peers in order to receive services or measure progress, but it can be detrimental to focus on what a child should be doing at a specific age instead of supporting them and reinforcing them for progress within their current stage. The child learns the phrase “I want _____ please.” This phrase is fine for “I want juice, please” or “I want Brobee, please,” but it loses meaning when overgeneralized to “I want jump, please” or “I want play, please.” It’s better to allow your learner to acquire hundreds of 1-2 word mands (or requests) before expecting them to speak in simple noun+verb mands. The child learns to imitate only when the word “say” is used. Then the child makes statements such as “say how are you today,” as a greeting or “say I’m sorry,” when they bump into someone accidentally. Here, the child clearly has some understanding of when the phrases should be used without understanding the meanings of the individual words within each phrase. The child learns to say “Hello, how are you today?” upon seeing a person entering a room. A child comes into the classroom and the learner looks up, says “Hello, how are you today?” The child responds, “Great! Look at the cool sticker I got!” Your learner then doesn’t respond at all, or may say “fine,” as he has practiced conversations of greeting. These are only a few of the common language errors you may see. While you may want your learner to speak in longer sentences, your goal should be to have them communicate effectively. With this goal in mind, it becomes essential to support them at their current stage, which means it’s essential to assess them and understand how to help them make progress. This is why I always use the VB-MAPP to assess each child and make decisions about language instruction. I need to have a full understanding of how the learner is using language, and then move them through each stage in a clear progression. I may want the child to say “Hello, how are you today?” But when I teach them that, do they understand those individual words? Do they comprehend what today means as opposed to yesterday or tomorrow? Do they generalize the use of “how” to other questions? As you make treatment decisions for your learner, think about their current stage and talk about how to support your child with both a Speech Language Pathologist and an ABA therapist. *Brown, R. (1973). A first language: The early stages. London: George Allen & Unwin Ltd. When I first heard about SAFMEDS, I wondered how they were different from standard use of flashcards. What I learned, in fact, is that the process is quite different, and it’s evidence-based! SAFMEDS is actually an acronym that means “Say All Fast Minute Each Day Shuffled.” (I know, I know…it doesn’t exactly roll off the tongue.) Created by Ogden Lindsley, SAFMEDS are focused specifically on fluency, or, in other words, speed and accuracy. While there are some things that don’t require fluency, there are many things that do: such as simple multiplication or letter recognition. This means that some tasks I teach my students will require the use of fluency training, which is often completed through the use of SAFMEDS. Lindsley outlined results of his experiments using SAFMEDS with students and demonstrated that this process of instruction resulted in faster acquisition of fluency than other, similar flashcard procedures (Lindsley, 1996) with his work having been replicated many times over. So, how do you implement SAFMEDS? First, get your materials together. Create your flashcards. (I typically use index cards where I’ve written the problem on one side and the correct response on the back.) Be sure to get a timer. You will have ALL the flashcards available and the student will respond to as many as he/she can in one minute. The student can run the activity on their own, and will likely go much faster if they are the one turning the cards (Lindsley, 1996). The student looks at the card, provides the response, then puts the card in the correct or incorrect pile. The cards should be shuffled between each fluency drill so that the student won’t learn the answers in order. I’ve used actual flashcards, but also created SAFMEDS sets using different apps and websites. If you’re interested in learning more about implementing this simple strategy for building fluency, you should take a look here for more information. Lindsley, O. R. (1996). The four free-operant freedoms. The Behavior Analyst, 19(2), 199. Fail to identify individual reinforcers. Hands down, the most common error I see is identifying specific activities or items as reinforcing. For instance, many people love gummy bears, but they make me want to puke. Presenting me with a gummy bear would not increase my future likelihood of engaging in the appropriate behavior! You must account for individual differences and conduct a preference assessment of your learner, then make a plan based on his or her preferences. Fade reinforcement too quickly. Let’s say you’re working with a child named Harold who draws on the walls with crayon. You implement a reinforcement plan in which he earns praise and attention from his parent each time he draws on paper. The first few days it’s implemented, Harold’s rate of drawing on the wall greatly decreases. Everyone claims that his behavior is “fixed” and suddenly the plan for reinforcement is removed… and Harold begins drawing on the wall once more. I see this sort of pattern frequently (and have even caught myself doing it from time to time). After all, it can be easy to forget to reinforce positive behavior. To address this issue, make a clear plan for fading reinforcement, and use tools such as the MotivAider to help remind you to provide reinforcement for appropriate behavior. Inconsistent with reinforcement plan. Harriet is writing consistently in a notebook, to the detriment of her interactions with peers. Her teachers implement a DRO, deciding to provide reinforcement for behavior other than the writing. However, the teachers didn’t notify all the adults working with her of the new plan, so Harriet’s behavior persists in certain environments, such as at recess, allowing her to miss multiple opportunities for more appropriate social interaction. To address this issue, make a clear outline of the environments in which the behavior is occurring and what adults are working in those environments. Ensure that all of the adults on that list are fully aware of the plan and kept abreast of any changes. Don’t reinforce quickly enough. This one can be quite challenging, depending on the behavior and the environment. Let’s saying you’re working with a boy named Huck who curses often. You and your team devise a plan to reinforce appropriate language. You decide to offer him tokens that add up to free time at the end of the school day. However, sometimes as you are handing him a token for appropriate language, he curses again right before the token lands in his hand. Though it was unintentional, the cursing was actually reinforced here. Remember that reinforcement should be delivered as close to the desired behavior as possible. To address this issue, consider your environment and materials and make a plan to increase the speed of delivery. Fail to make a plan to transfer to natural reinforcers. Ultimately, you don’t want any of these behaviors to change based solely on contrived reinforcement. Making a plan for reinforcement of appropriate behavior is essential, but your ultimate goal is to have the behavior be maintained by naturally occurring reinforcement. To address this issue, the first thing you need to do is identify what that naturally occurring reinforcement might be. For Harold, it might be having his artwork put up in a special place or sharing it with a show and tell. For Harriet it might be the interactions she has with peers on the playground. Once you have identified those reinforcers, you can create a plan for ensuring that the learner contacts those reinforcers over time. This might include pairing the naturally occurring reinforcers with the contrived reinforcers, then fading out the latter. Ultimately, it’s important to remember that reinforcement is not as simple as it seems. Taking the time to plan on the front end will help with long-term outcomes. Sometimes our learners don’t comply with instructions simply because they don’t fully understand what we are asking of them. At times, I find myself making the error of using too many words when I give directions, especially if I’m in a rush during a transition. For instance, I might say “Grab your shoes, put them on, and meet me by the door.” A few seconds later my learner meets me at the door, but with no shoes. I may feel frustrated or irritated, but ultimately I realize my instructions are provided in a poor manner. I am at fault! It would have been more effective to point towards the shoes and say “Shoes on.” In his book Teach Like A Champion, Doug Lemov refers to this as Economy of Language, a phrase that essentially means the fewer words you use, the clearer your message. (It should be noted here that Teach Like A Champion is written for ALL teachers, not just special education teachers. This is a strategy that works across the board!) This is especially true when working with learners who struggle with listening comprehension, attention, or multi-step directions. Plan ahead. I actually write out instructions that I will be providing often and plan precisely how I will be giving them. I might plan a few variations, but, especially when working with young learners with autism, I want to provide lots of opportunities for success, then build to more complex instructions. Consider hand signals. I often pair a hand signal with an instruction. For instance, one of my current students often sticks his fingers in his nose during instruction. I pair “Hands down” with a hand motion in which I move my hand from about shoulder-height to my lap (down). This is helpful because the learner also comprehends the signal, and I can begin providing the signal without the vocal statement. This allows me to provide instructions without interrupting the lesson. One step at a time. Be aware of your learner’s listening comprehension and attending skills. If you notice that your learner is often only completing the first or the last thing you asked, this is a good indication that you provided too many instructions at the same time. Avoid lengthy explanations. Sometimes I’ll hear an adult say something like “You need to hurry up and put your shoes on because your father is going to be here in a moment and we need to meet him outside and get in the car quickly so you’re not late for swim practice.” This is an easy trap to fall into, especially if vocalizing the explanation is helping you remember everything you need to do during a transition, but it may result in inaction from your learner. Take a deep breath. If your learner is not responding correctly to instructions you’ve provided, step back, take a deep breath, and think about how to simplify the instruction. 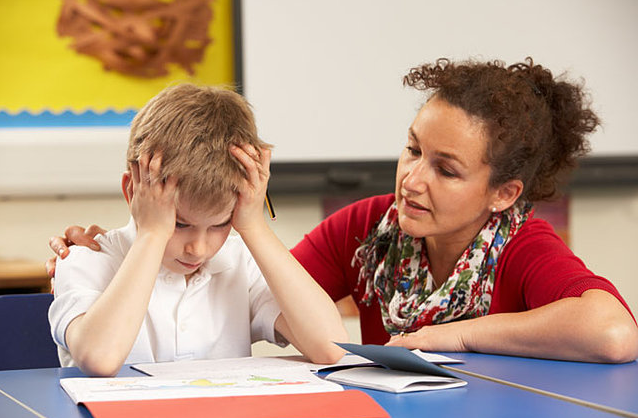 Many classroom teachers are required to take data on the behavior of their students. However, this can feel like a daunting task given the many things teachers are trying to do simultaneously throughout the day! 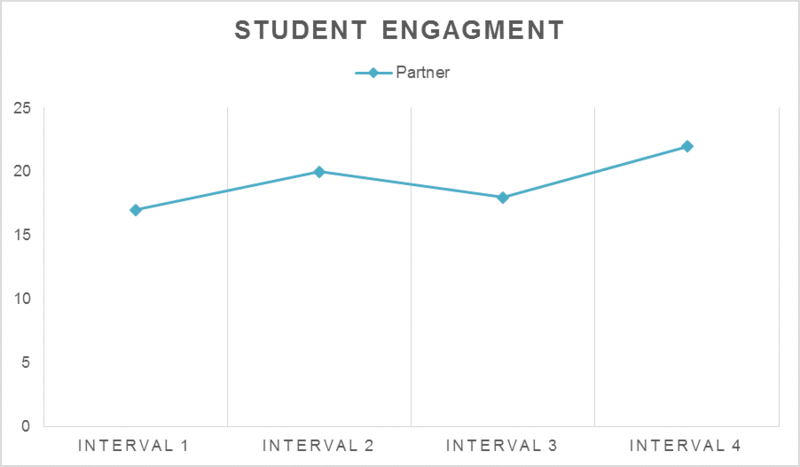 PLACHECK is a simple way to measure group behavior in the classroom for engagement or attention. PLACHECK is short for Planned Activity Check. Let’s say that Ms. Esterman is using a partner activity for a math lesson for the first time in her fourth grade classroom. She wants to see if the kids remain engaged with the content during the partner activity. Here is how she can implement PLACHECK to collect data on engagement. Set a MotivAider for a predetermined interval (learn more about the MotivAider). The partner activity Ms. Esterman has organized will take a total of ten minutes. She decides to set the MotivAider for 2 minute intervals. At the start of the lesson, set the MotivAider to run and clip it to your waistband. For Ms. Esterman, the MotivAider will vibrate every two minutes to signal her to observe her students. When the MotivAider vibrates, collect tally data. Ms. Esterman feels the MotivAider vibrate, then quickly counts the number of students who are engaged in the partner activity. Continue to do this for each interval. When she compares the two days, she finds these results, and it allows her to make better decisions about what types of activities might work best for the individuals in her classroom. 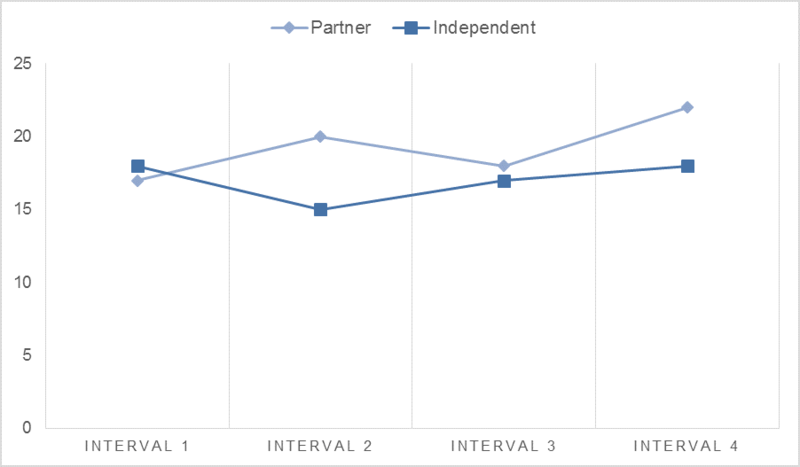 Here, it is clear that between these two activities, her students were more likely to be on task during partner work. However, Ms. Esterman would attain better results by taking more data. PLACHECK is simple to implement. Ms. Esterman is able to collect this data in less than two minutes each day and can learn a lot from just that brief time. differential reinforcement or our post on noncontingent reinforcement. When possible, the consequence should be connected to the behavior. If your child throws a controller, then not having access to video games makes great sense. However if video games are taken away for any infraction, it may not be the most logical punishment and over time, it may even backfire. If the child is losing video games for everything, then he/she might stop trying to earn video games at all. BCBAs are required to take extensive coursework in applied behavior analysis and complete 1500 hours of supervised work. Furthermore, they are required to take a difficult comprehensive exam at the end of their coursework and supervision hours. Once they have completed the hours and passed the exam, they are officially a BCBA. BCBAs must complete 32 units of continuing education every two years. There is a requirement that some of these hours pertain to ethics, but the rest can be focused on skills such as addressing verbal behavior, feeding issues, aggressive behaviors, and more. BCBAs are held to the Professional and Ethical Compliance Code for Behavior Analysts. If a BCBA does not comply with the code, they can be reported to the Behavior Analyst Certification Board. Several states have also introduced licensure for behavior analysts, so there may be a state board for reporting any ethical violations. BCBAs are required to utilize evidence-based practice. A BCBA should be aware of current research in the field and should be able to easily reference the literature when encountering a difficult problem or working on an intervention. One of my favorite parts of the ethical code for BCBAs is that “clients have a right to effective treatment.” Your BCBA should be taking data and implementing interventions that are effective in creating behavior change for clients. If an intervention is not working, then adjustments should be made. The goal of Behavior Analyst Certification Board is to ensure appropriate training and accountability for behavior analysts. Sam is an ABA provider for students ages 3-12 in NYC. Working in education for ten years with students with Autism Spectrum Disorders and other developmental delays, Sam has developed strategies for achieving a multitude of academic, behavior, and social goals. Sam is currently pursuing her PhD in Applied Behavior Analysis at Endicott College. There is a common misconception that individuals with special needs require a slower pace of instruction. While they may require a slower pace through a curriculum, this does not mean that individual lessons should be taught at a slower pace. In fact, slowing the pace of instruction not only wastes precious instructional time, it may increase the occurrence of problem behaviors. Higbee (2009) writes that “appropriately paced instruction helps students to maintain attention to the instructor and instructional materials. Though student attention can be lost when instruction is happening too rapidly, it is most often lost when the pace of instruction is not rapid enough” (p. 20). Prepare! Set out your materials in such a way that they are easy to access quickly. I keep all the mastered skills on index cards so I can easily add maintenance questions into instruction. Organization is often the simplest way to increase efficiency in your session. Take data. You want to increase attention and decrease problem behaviors. Try different paces of instruction and measure the behaviors you are wanting to change. For instance, if I have a student who is often grabbing for my shirt during a session, I may try a pace of instruction that includes 15 questions each minute, then try a pace of 20 questions per minute, another of 25 per minute. Next, I will compare the rates of grabbing for my shirt with each pace of instruction. Remember, these aren’t 15 questions for the target skill; some mastered skills will be intermixed. Record a session. By taking video of yourself working with a child, you may see opportunities for increasing efficiency on your own. You may also observe specific times at which problem behaviors tend to increase, then be able to target those specifically. For instance, perhaps problem behaviors occur when you turn to write data in a binder, but didn’t recognize that pattern until you watched a recording later. Use reinforcement effectively. Usually, pace of instruction in and of itself will not change behavior. Instead, pair it with reinforcement and be systematic with how you implement reinforcement. We’ve talked about reinforcement here on the blog a lot, so you can read about that in more detail here. If possible, get input from supervisors or the individual you are working with. Supervisors may be able to observe your session and provide insight on how to increase your pace of instruction. And the individual you are working with may be communicating that they are bored through misbehavior, stating “I’m bored,” or nonvocal behaviors such as yawning. This may be an indication that you need to provide more challenging material or increase the pace of instruction. Higbee, T. (2009). Establishing the prerequisites for normal language. In R. A. Rehfeldt, Y. Barnes-Holmes, & S.C. Hayes (Eds. ), Derived relational responding applications for learners with autism and other developmental disabilities: A progressive guide to change (7-24). 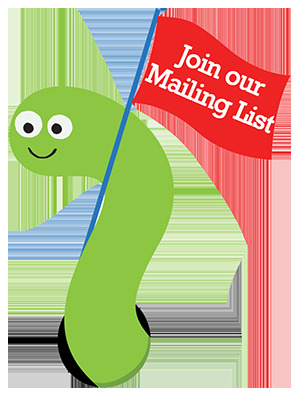 Oakland, CA: New Harbinger Publications, Inc.